The Radical ski touring boot is a versatile touring boot for the classic ski touring enthusiast. Comfort and easy handling distinguish the boot. With 1,790 grams, this boot sits in the mid-weight class and is suitable both for novices as well as experienced ski tourers. Four buckles guarantee good support on the descent. The patented Motion Lock Ski/Walk Mechanism can be adjusted very easily and secured in one of two positions: 15 or 21 degrees of forward lean. The Ultra Lock Straps at the front of the upper ensure quick hold and can be readjusted with one hand. 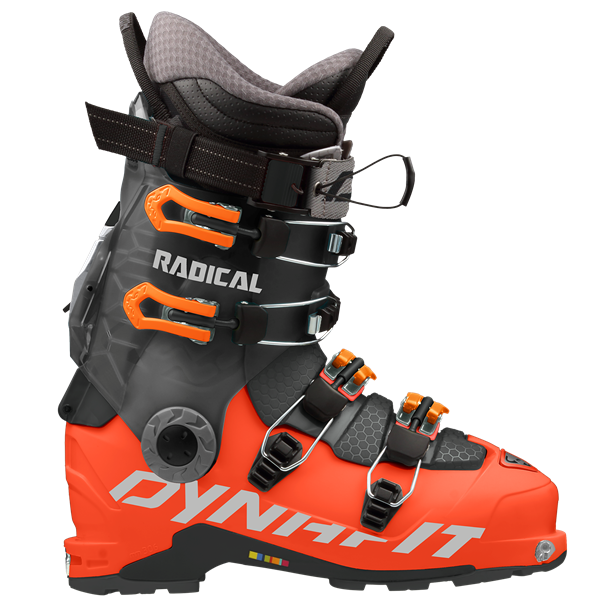 The boot liner of the DYNAFIT Radical is thickly lined and developed with an eye on great comfort. The POMOCO rubber blend in the outsole doesn't change when temperatures do and offers consistent performance when it comes to grip and stance while walking when not in the binding. This boot was produced in Europe.